It’s official, I have a soft spot for vintage, serpentine pieces. You can imagine how giddy I was when I came across this jewel. 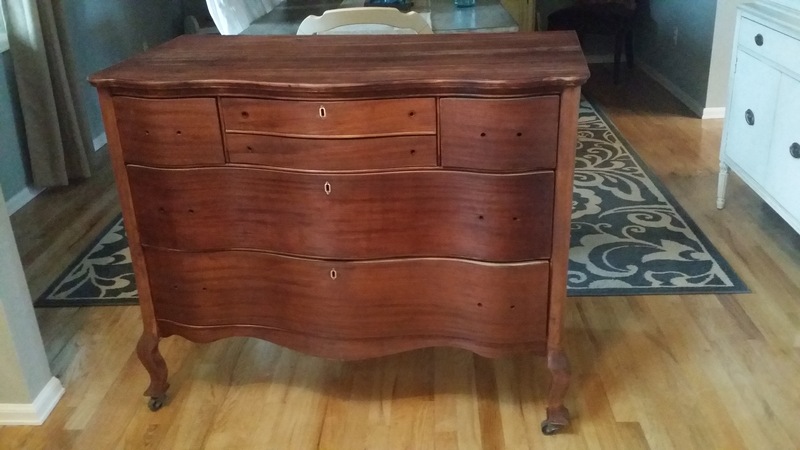 The finish on the wood stain was bad, there was no hardware to speak of, other than the locking skeleton key and the bottom drawer would not close very well. 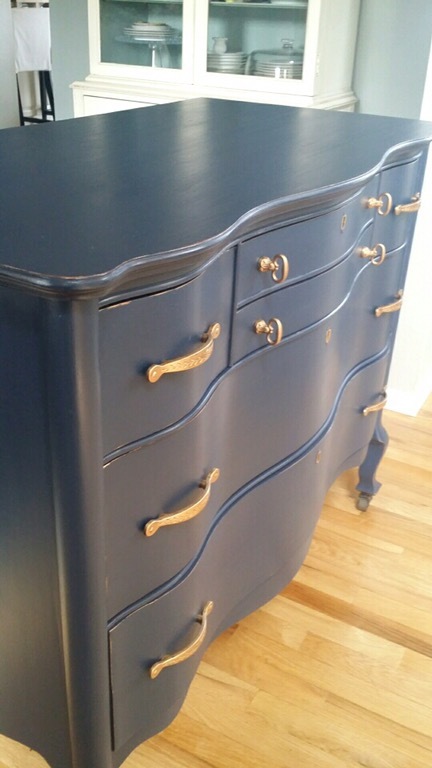 But she was a diamond in the rough, with that delicious curvy front, original caster wheels and 3 locking drawers. Potential was just a paint brush away. This is what I started with…..
Not too bad in a picture, but up close and personal the finish was not pretty. I knew instantly that I wanted to go Navy. It’s so ‘Hot’ right now and truly, it has quickly become one of my favorites. It’s also way more neutral than one might think. 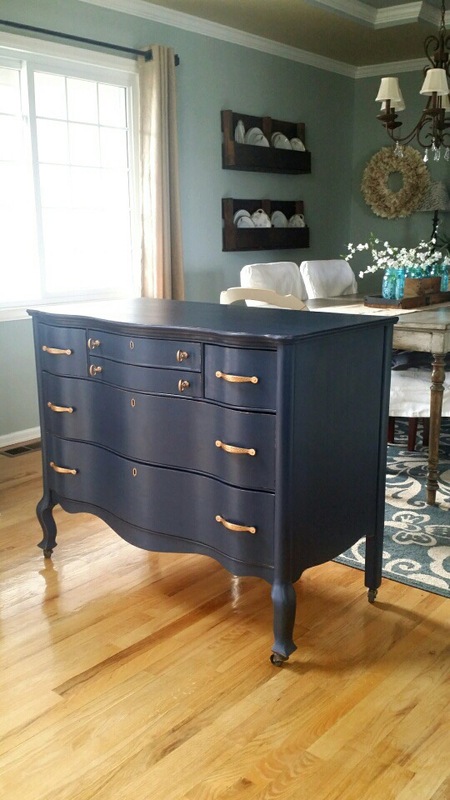 Ive rehabbed several pieces in Benjamin Moore-Hale Navy, but I was dying to try Sherwin Williams-Naval. It’s slightly deeper in tone. After a good cleaning and light sanding I mixed up some DIY chalk paint using Calcium Carbonate. It’s my ‘go to’ mix every time. Dissolves really well in water and does not clump up or become gritty when mixed thoroughly into latex paint. I applied 2 coats of the ‘Naval’ paint in no time. I purchased all new hardware from Hobby Lobby. 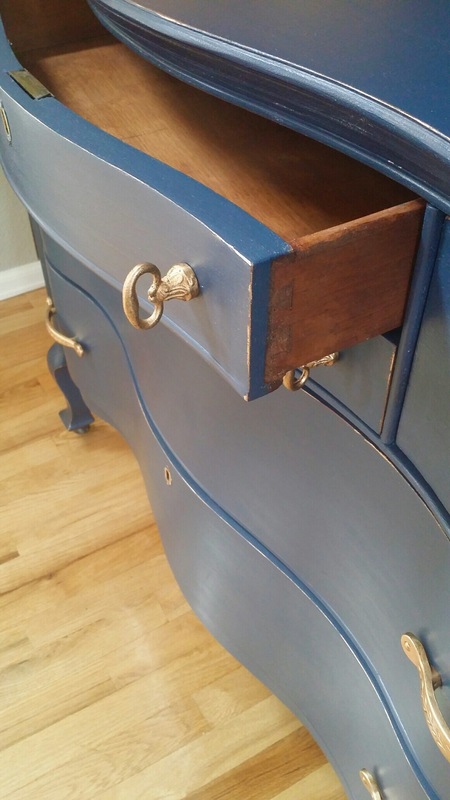 However, because the hardware of the drawer pulls are flat and the drawers are curved, I asked handy hubby to help me bend them slightly so as to allow them to sit a bit more flush against the drawer. Well, bad news……it completely broke. Literally, what feels and looks to be metal hardware is actually made out of some type of composite material and it snapped like a tree branch. Back to the drawing board. I kept the knobs for the narrow top drawers and began scouring Amazon for some drawer pulls with a vintage appeal and found some that only came in packs of 10. Two days later those arrive. Again, my sweet hubby attempts to bend the pulls ever so slightly. And what happened you ask? It snapped, just like the Hobby Lobby ones…..UGH! The packaging even stated that the material is ‘metal’……umm….ok…..but no they aren’t. Praise God I only needed 6 pulls, so I just went with it. 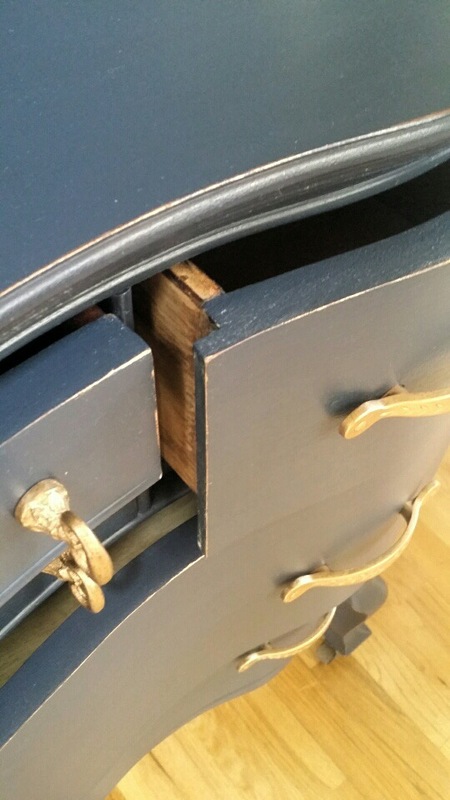 The edges do not sit quite flush against the drawer, and you know what?….they look awesome. I buffed all of the hardware with gold ‘Rub n Buff’, my favorite stuff ever. After painting this piece, I lovingly distressed it. 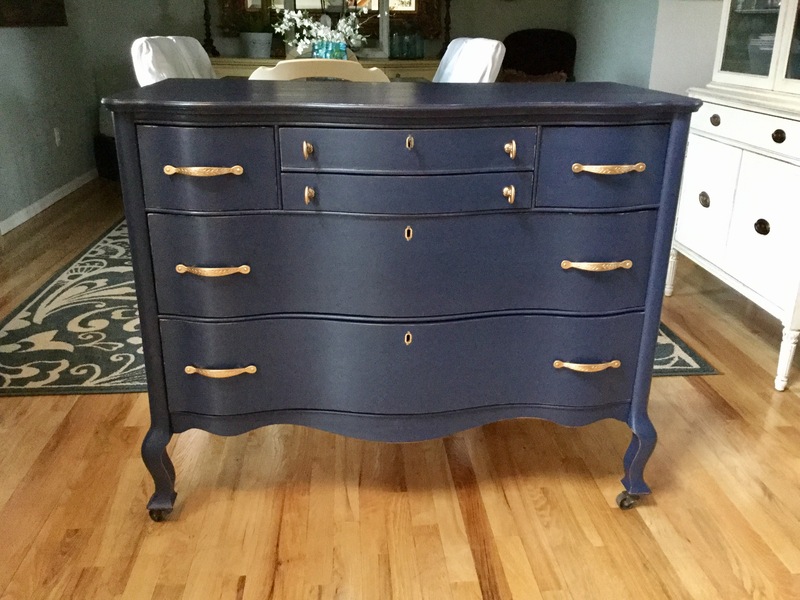 The areas that I distressed I lightly touched with the gold Rub n Buff, such a sweet accent to the deep navy. 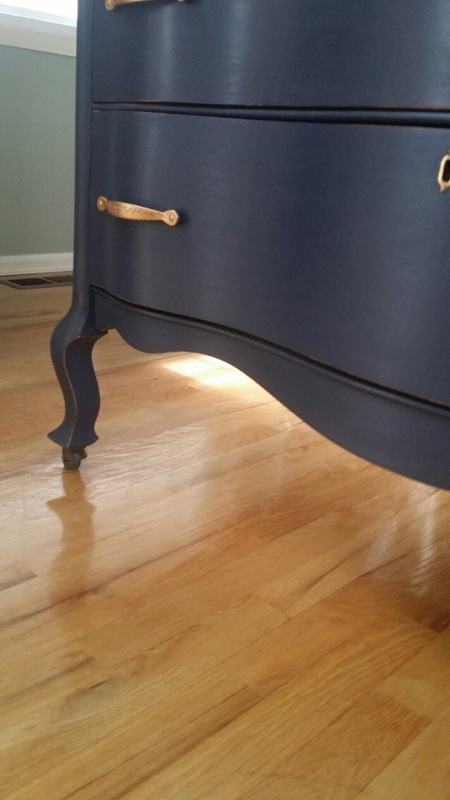 The body of the piece was given a good coat of clear wax and buffed to a pretty vintage finish. I applied 2 coats of a wipe on Polyurethane to the top surface for added durability. The navy and gold look so super sharp together, very stately and timeless. The super double bonus prize……it sold in less than 48 hours. The new owner of this jewel just bought her first home. Hope she enjoys it for years to come.